When a market charges taker and maker fees, they differentiate whether you're increasing the size of the order book or decreasing the size of the order book. When you create an order that is immediately matched with already existing orders, you're a taker because you take liquidity from the market. When you add an order that doesn't match existing offers, you add liquidity to the market and are charged a maker fee. If you add a buy order at $1000 for 2 BTC, you will immediately match the offers of Alice and Bob. You're a taker. If you add a buy order at $993 it doesn't get matched and you're a maker. A maker fee is when you create an order on the order book (this could be a buy or a sell) and someone else completes it, therefore you pay no fees and get the amount paid. The one that completed your order pays the fee. The other way around, if you sell into a order already posted, you pay the fee, and they do not. Taker fee is when you complete someone else's order, in which in your case, its currently .3% of the total order value. First know who is maker and who is taker? 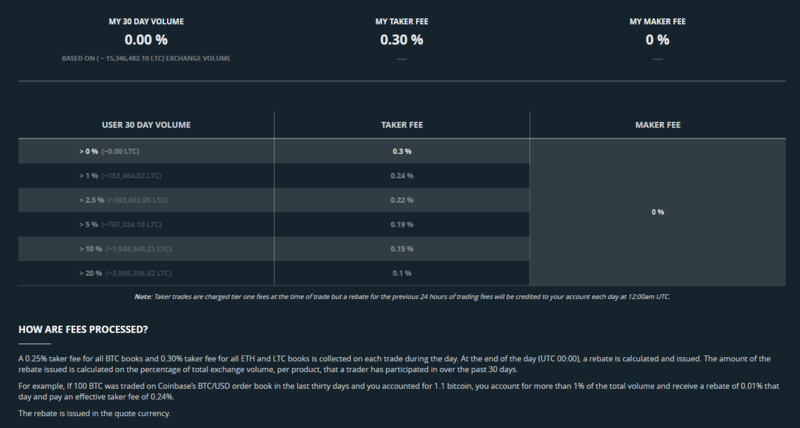 If you place an order above the current ticker price for selling or below the current ticker price for buying, you add liquidity to the market and you thus act as maker. In this case you have to pay maker fee. If you want to fill your order at the current market price, you are taking liquidity from the market and you thus act as a taker. In this case you have to pay taker fee. Usually taker fee will be higher than maker fee. A TAKER is when you place an order at the market price that gets filled immediately, you are considered a taker and you will pay a fee for books. A MAKER is when you place an order which is not immediately matched by an existing order, that order is placed on the order book. If another customer places an order that matches yours, your fee will be 0% and you are considered the maker. You will pay a taker fee when you place an order that gets partially matched immediately. The remainder of the order is placed on the order book and, when matched, is considered a maker order. The fee is 0% for that part of the total order. If we add a buy order at $100, it will immediately match the order No. 1 and No. 2. We are a taker and we will pay a taker fee. If we add a sell order at $95 or less, it will match right away the order No. 3, and we are the taker. If we add a buy order at $91 it will not match any order at the moment, and we will be a maker and we will pay a maker fee, whether there is any (it will probably be 0). If we add a sell order at $99 for a BTC, it will not match any order at the moment, and we will be a maker (it will probably be 0). Not the answer you're looking for? Browse other questions tagged bitcoind exchange-fees or ask your own question.